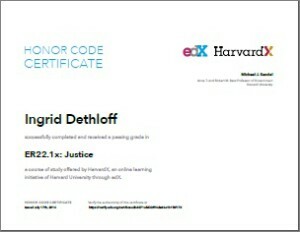 Today I finished the HarvardX Justice MOOC on edX with the final exam. There was no time limit for the test, however, after the first half, I got timed-out and had to log in again and continue, which was irritating as I didn’t know what would happen once I had left the web form. 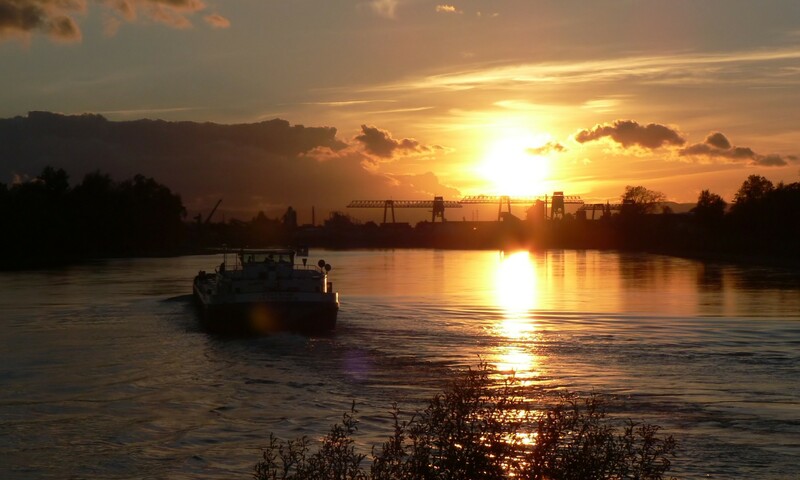 In the end, the result was very successful and I am looking forward to getting my certificate after July 15th. The course felt like a long time period (12 weeks) – I actually prefer MOOCs with about 4-6 weeks. However, the incentive of the course certificate was very strong for me – and certificate in context of this course meant doing the final exam. In order to do that, it was necessary to engage with the content of 24 lectures (each about 25 minutes), at least that’s what I thought and prepared to do accordingly. The topic „What’s the right thing to do“ was very interesting up to the end of the course and the 24 self tests and 5 graded quizzes during the course were very helpful. I really liked the course structure with 2 poll questions every week and the subsequent challenges – you got a live feeling and it helped to trigger short forum entries discussing pros and cons. I’ve scrolled through many forum posts and was reminded once again, that the (cultural) diversity of the participants is always a big factor in MOOCs. You don’t get that in closed environments. And moral reasonings and questions about political theory naturally differ a lot between different countries and cultures. In this course I got a better understanding of distributive justice and indeed, it influenced my way of thinking: „Once the familiar turns strange, once we begin to reflect our circumstances, it’s never quite the same again“. It would have been nice to have a live session with Prof. Sandel, but that was apparently limited to the first run of the MOOC last year. It’s my second MOOC which I officially completed, and it was very different from the cMOOC „Moodle MOOC on WizIQ“ in June 2013. The Moodle MOOC focussed on letting the participants produce digital artifacts, discussing and sharing (accompanied by many live sessions with learning experts) whereas the Justice MOOC was about learning a lot of predefined content (video lectures) and reflecting about theories. In my opinion, both didactical concepts were very good and fitting for the particular purpose. I have taken many, many MOOCs in the last years, obviously only a small part of them with the official stamp of completion. That doesn’t mean that I didn’t like some of the other ones or that I failed there. On the contrary, I learned a lot by attending live sessions, reading some of the literature and taking part in discussions. Certificates may be a nice incentive, but if you don’t need a certificate, why should you go the extra way? I think the aspect of the MOOC completion rate as a general success factor is heavily overrated – eventually MOOCs are open for everyone and shouldn’t come with too many restrictions (you have to do this and you have to do that until [date] otherwise you get drawbacks etc.). I also think we should appreciate the „quiet“ MOOC participants who learn their own way and don’t like to express themselves like some others do in many, many forum posts (for me, the term „lurkers“ is a very disrespectful one). In conclusion, it is very important to define in advance what a MOOC is about, the workload, expectations and the paths (and level of participation) a learner might take. A short survey at the beginning (including the option „just checking out this MOOC“) and a short midterm survey won’t hurt.